“This is certainly my best work”, Jerry said as I approached him to sign the copy of the book. The purple paperback is complemented by the purple end at each page. It reminded me of the autumn street of Kathmandu where the streets were full of purple flowers. The book starts with a love letter, an unusual kind of letter which starts with “Dear Angel Ears”. The preserved letter has been read by the son, who found this letter in his mother’s closet. 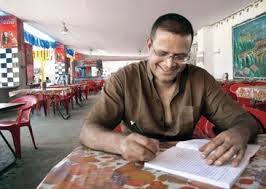 He is re-reading the letter to his mother and asking her why did she call his father “Angel Ears”. There is so much honesty and truthfulness in the conversation that you forget that it was in the mental wardof JJ Hospital where the mother is a regular refugee. Em and the big Hoom is the story of a family, based on the 1980s in the 1-bedroom apartment in Mahim in Bombay. The book is centered around “Em” who is mentally challenged, suicidal in nature, mother of 2 and wife of the “Big Hoom”. She calls herself mad, smokes beedi, does lot of name calling, does not bathe for many days, carves for tea and invites personal insults. There is good insight of the characters, the flashback takes us to the delicious past of Bombay where jobs were scare but space was in abundance. The younger versions of the Em and the Hoom were also delight to read. There are traces of humor in middle of tragedies, smiles in middle of tears, satisfaction in middle of fear and hope in middle of misery. How the mental weakness of one is complemented by the strength of others and the value of raising a family, no matter what, is one of emotions which will stay with you, long even after you have read the book. This book is particularly for those who doubt Indian writing in English. 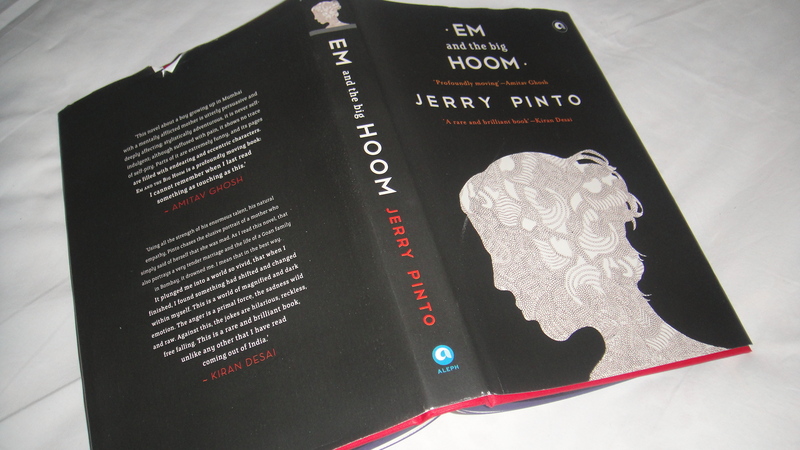 Jerry Pinto is the great ambassador of the generation of Indian Authors and when he says that it is one of his finest work, there is very little left for the argument. I gave Em and the Big Hoom , a 5 out of 5 star in goodreads. I strongly recommend this book to the lovers of expression, metaphors, emotions,honesty and a rare sense of humor which this book offers in abundance. Do not deny yourself this pleasure.